Shortlisted for Gourmand World Cookbook Awards 2017 - Best Indian Cuisine Book Meeru Dhalwala and Vikram Vij, the dynamic team behind North America's celebrated Indian restaurants, bring together a beautiful new collection of beloved recipes cooked at their restaurants that they also regularly cook at home. These are those special recipes that come from the journey of life and are full of meaning, stories and Indian flavours. 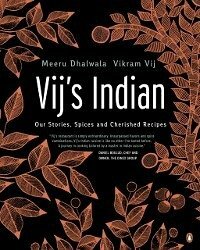 This is a cookbook for Indian home cooking, which is Meeru and Vikram's source of nourishment and health. They eat and enjoy meat, but at home they (especially Meeru) emphasize healthy, delicious vegetarian food, with meat curries served once or, at most, twice a week. Through the beauty of cooking with Indian spices, their vegetarian meals are so delicious that you won't even think of meat. Inside, you'll find an abundance of vegetarian recipes along with plenty of fish, poultry and meat recipes for everyone's enjoyment. Vij's Indian features 80 original and inspiring recipes, carefully crafted for both new and experienced home cooks. Meeru and Vikram will show you how to make dishes like their Grilled Squash with Sugar-Roasted Beets and Cumin-Spiced Onions, Chickpea and Sprouted Lentil Cakes, Vegetable Koftes with Creamy Tomato Curry, Green and Black Cardamom Cream Chicken Curry, Mildly Curried Beef Short Ribs and Lamb Popsicles with Garlic and Ricotta-Fenugreek Topping. It's for everyone who wants to cook modern Indian cuisine, and Meeru and Vikram are with you every step of the way. They've included pairing suggestions for recipes, so you'll have lots of ideas and options to keep your Indian cooking dynamic. Assorted Mushrooms and Winter Squash Curry paired with Brown Rice and Yellow Channa Daal Pilaf or Clay Pot Saffron Chicken and Rice paired with Sprouted Lentil, Bell Pepper and Carrot Salad-the combinations are endless! Complete with all the basics on Indian spices, essential Indian staple ingredients, expert tips and suggested wine pairings, Vij's Indian is a beautiful new collection of recipes. Meeru Dhalwala was born in India and moved to Washington, D.C., at a young age. Prior to moving to Canada, she worked with international non-profit organizations on human rights and international development projects. Meeru joined Vikram at Vij's in 1995 and together they run Vij's and Rangoli restaurants in Vancouver. Vikram Vij was born in India and grew up in Amritsar and Mumbai. He studied hotel management in Salzburg, Austria, before moving to Canada to work at the Banff Springs Hotel. He opened the original fourteen-seat Vij's Restaurant in 1994, and has appeared on many television shows and regularly cooks for events, including the James Beard Awards gala in New York. A certified sommelier, he is passionate about pairing wines with Indian food. In addition to running Vij's and Rangoli with Meeru, Vikram is the chef and owner of My Shanti. Meeru and Vikram received joint honorary doctorates from the University of British Columbia and Simon Fraser University for their work in the community on advancing Indian cuisine and promoting sustainable food practices and Indian culture.